In the first month of MY 2018/19, pea exports from Ukraine totaled 47.8 KMT, or 58% more than in July 2017/18. It is worth noting that 2017/18 export shipments of Ukrainian peas reached a record 873.5 KMT that is up 80% from the previous marketing year. The pea import restriction imposed by India in the 2017/18 season affected the geography of pea exports from Ukraine. So, while India was the biggest buyer of Ukrainian peas in MY 2017/18, no shipments have been made to this country in the current season. 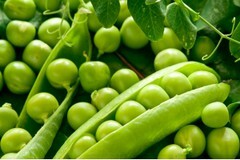 The biggest buyer of Ukrainian peas in July 2017/18 was the European Union, which accounted for 53% of their total exports. Ukraine’s proximity to the EU and acceptable prices to European consumers are the factors that may make the EU the top destination for Ukrainian exports this season. In addition, 38% of this season’s pea exports from Ukraine went to Asian and Near East countries and 9% to African countries. Asia and the Near East absorbed 83% of Ukrainian pea supplies in MY 2017/18, mostly due to India and Turkey.